For someone born in the United Kingdom and who spent his formative years in Perth Australia and whose early musical experience included playing trumpet and euphonium in brass bands, Peter D. Harper has become one of the foremost American roots musicians today. In terms of acoustic blues, Harper has earned affirming praise from many sources. This month, he received a Detroit Music Award for Outstanding World Music Vocalist. Inducted in 2011 into Canada’s Blues Museum Hall of Fame in Windsor, Harper also recently received other major honors including Best Instrumentalist from Big City Blues Magazine and Best Live CD from Blues 411 in New York City. Slated to perform on the festival’s closing night, Harper will be the last of a series of distinguished world-class musicians who have managed to stretch and synthesize so many musical boundaries. 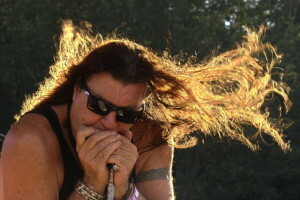 Harper brings the harmonica, harp, and, perhaps most significantly, the uniquely native Australian instrument of the didgeridoo into a fascinating song style that incorporates the blues along with other roots of American music. Performing along is the band Midwest Kind from Michigan, where Harper now lives, which includes Mike Howe on lead guitar, James Norris on bass guitar and Greg Sauceda on drums. Harper and Midwest Kind are making other Utah stops including Ogden and the Groovefest American Music Festival in Cedar City, which he says in an interview with The Utah Review, reminds him of Western Australia where he spent his younger years. Perth always has been a fertile ground for blues and blues-inspired rock, he adds. “Everyone listens to the blues as well as bands likes Cream, Led Zeppelin, Eric Clapton, and in the 1970s it was a really healthy scene.” A songwriter whose skills are just as strong as his instrumental work, Harper says that the exposure and the capacity to blend soul and rock with other what he calls “real” forms of music such as bluegrass and folk have given him great freedom in his music writing. Other influences include came along including Muddy Waters, Sonny Boy Williamson II , Little Walter, Sugar Blue and Stevie Wonder. 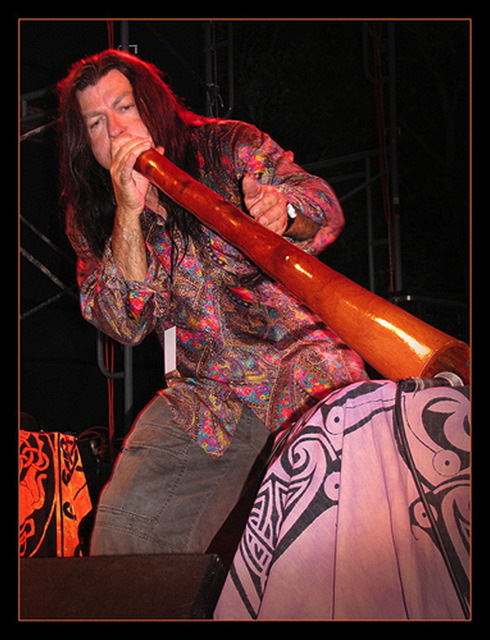 However, it is his deep cultural and social reverence for the circumstances of native Aboriginal peoples in Australia, who graciously offered to share their expertise on the didgeridoo, that seems to have provided the critical link in developing a synthesized musical style that doesn’t just speak for its purposes of entertaining but also for becoming more fully aware of the responsibility to ensure native peoples – in Australia, the United States, and every other part of the world – are guaranteed fully their rights to basic human and economic justice. Harper, like other musical artists featured at the festival, likes to go with the organic flow of his song writing. “I like to take along a little voice recorder and when I have a tune or lyrics come into mind, I’ll say them into the recorder wherever I am,” he says. “Sometimes, of course, people walking by might look at me as strange.” As for his songs, while he intends for them to communicate meaningful social messages, he avoids the need to preach politically. “For me, the message is simple: love equals peace equals freedom,” he adds. All of Harper’ Blind Pig releases have gained much attention, including his 2005 American debut ‘Down To The Rhythm,’ ‘Day By Day’ (2007), and ‘Stand Together’ (2010) which climbed into the top 10 on Billboard charts and was the most requested music on Sirius XM’s Bluesville Charts. Other releases include ‘Live at The Blues Museum’ (2012), which was recorded when he was inducted in the Blues Museum Hall of Fame in Canada, and a compilation of acoustic music titled ‘Harper and Motor City Josh” “Bare Bones”‘ (2013) . MarchFourth Marching Band. Photo by Andy Batt. From Portland, Oregon, this band has been bringing the party to festivals, concerts, and major television appearances – including MTV’s ‘The Real World’ and ESPN’s ‘Espy Awards’ – for 11 years. Indeed, it has been one of the most successful examples of how street theater groups can make it by spreading the word at grassroots level. The group, often numbering 20 performers, includes five percussionists and eight brass players, all of who are adorned in vintage band uniforms. 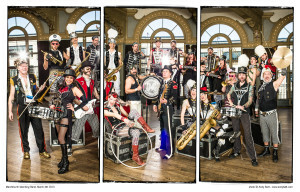 Add bass and guitar, along with a corps of five dancers and stilt-walking acrobats, and the group will play anything from funk and creole to gypsy and rock, with plenty of touches from Europe and South America mixed in the music. The group’s trademark is its originality. Everything from the music, choreography, uniforms, and routines is made by members. Even a pair of albums were recorded in house, MarchFourth’s two releases were ‘Rise Up,’ which came out in 2009 as a tribute to the victims of Hurricane Katrina in Louisiana, and ‘Magnificent Beast,’ which was produced by Los Lobos’ Steve Berlin in 2011. The sound is always big and certainly brassy and it becomes a great game just to pull out all of the various musical influences that crop up in the band’s music. Spectators will hear punk, ska, swing, Bollywood, jazz, and even a tinge of metal. In many ways, the band is a great amalgam of how old-fashioned vaudeville and circus can look new again in a performance that picks up all of the best grooving characteristics of a hard-driving rock band.